Biola University has announced the 2016 Biola University Alumni Award recipients. 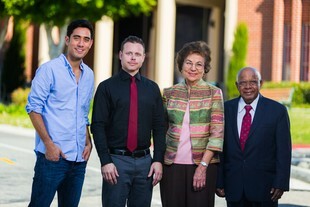 The four awardees, all graduates of Biola who have distinguished themselves in various ways, have each fulfilled Biola’s mission through making an impact on the world for the Lord Jesus Christ. A special chapel on Feb. 24 will honor this year’s recipients for their influence in culture, media, education and missions. Alumnus Thomas McCarty (’96) will receive the Cultural Impact Award for his contributions to film and television. McCarty’s work includes feature films such as Interstellar and Avengers: Age of Ultron, as well as top-rated shows such as Glee and Extreme Makeover: Home Edition. In addition, McCarty was director of photography for several independent feature films. According to one of his nominators, Tom exemplifies what it means to be Christ-like in a world that often wants very little to do with Christ. Thomas and his wife, Kristine McCarty, live in Orange County, Calif. with their two daughters. Alumna Joanne Shetler (’58) will receive the Clyde Cook Missions Award. Shetler has dedicated her life to making the gospel available to unreached people. Her first 20 years of ministry with Wycliffe Bible Translators were to a remote village in the northern Philippines called Balangao. The translation gave birth to churches with a few thousand Balangaos coming to Christ. Her experience with the Balangao people is in her book, “And The Word Came With Power.” After completing her master’s degree in intercultural studies at age 57, Shetler and colleague Amy West developed the Culture Meets Scripture workshop, a resource for equipping believers to resist pressures towards practices that conflict with their faith. Zach King (’12) will receive the Young Alumnus Award. King, known to millions of followers as “Final Cut King,” is a Vine, YouTube, and overall social media sensation. Fans around the world have enjoyed his video creations, and his work has landed him interviews on the Ellen DeGeneres Show, Good Morning America, and in People magazine. His success is represented well by the commercials he has made for the world’s most well-known companies and brands, such as Sony, LG, and Buick. Being referred to as “The World’s Best Vine Magician” by CNN is the type of recognition that some in the entertainment industry can only dream about, yet King has remained humble in his success. He lives in Southern California with his wife, Rachel. G.V. Mathai (’67) will be recognized with a Lifetime Achievement Award in Missionary Medicine and Christian Education. Mathai’s life has been marked by a call to know Christ and to make Him known. Since 1966, when he founded India Evangelical Mission, Mathai has devoted his life to training Indian nationals in reaching their own people with the message of the gospel. He has preached the gospel to thousands through his evangelistic ministry — starting Bible colleges, orphanages, and Christian reading rooms. Mathai also leads ministries to internationals living in the U.S. At 83 years of age, Mathai and his wife, Mariamma, still travel to India twice a year and take new groups on short-term mission trips. Mathai and Mariamma have four children and live in Southern California. Biola is proud to honor those who have made an impact through their work and done so much, going out into the world and affecting so many lives for Christ. Awardees are selected through a nomination process and decided upon by the Office of Alumni Relations and Biola’s Executive Alumni Board. Written by James O’Hearn, Public Relations intern. For more information, please contact Jenna Loumagne, Media Relations Specialist, at jenna.loumagne@biola.edu or via phone at (562) 777-4061.